The definition of a linear space (vector space)... became widely known around 1920, when Hermann Weyl and others published formal definitions. In fact, such a definition had been given thirty years previously by Peano, who was thoroughly acquainted with Grassmann's mathematical work. Grassmann did not put down a formal definition --- the language was not available --- but there is no doubt that he had the concept. As noted first by Grassmann... the light set has the structure of a cone in the infinite-dimensional linear space. As a result, a quotient set (with respect to metamerism) of the light cone inherits the conical structure, which allows color to be represented as a convex cone in the 3- D linear space, which is referred to as the color cone. The RGB color model is implemented in different ways, depending on the capabilities of the system used. By far the most common general-used incarnation as of 2006 is the 24-bit implementation, with 8 bits, or 256 discrete levels of color per channel. Any color space based on such a 24-bit RGB model is thus limited to a range of 256×256×256 ≈ 16.7 million colors. Some implementations use 16 bits per component for 48 bits total, resulting in the same gamut with a larger number of distinct colors. This is especially important when working with wide-gamut color spaces (where most of the more common colors are located relatively close together), or when a large number of digital filtering algorithms are used consecutively. The same principle applies for any color space based on the same color model, but implemented in different bit depths. The Adobe RGB (1998) color space is an RGB color space developed by Adobe Systems, Inc. in 1998. It was designed to encompass most of the colors achievable on CMYK color printers, but by using RGB primary colors on a device such as a computer display. 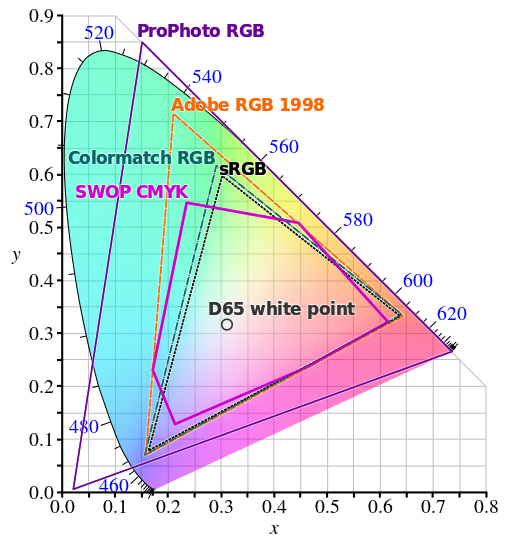 The Adobe RGB (1998) color space encompasses roughly 50% of the visible colors specified by the CIELAB color space – improving upon the gamut of the sRGB color space, primarily in cyan-green hues. The CIELAB color space (also known as CIE L*a*b* or sometimes abbreviated as simply "Lab" color space) is a color space defined by the International Commission on Illumination (CIE) in 1976. It expresses color as three values: L* for the lightness from black (0) to white (100), a* from green (-) to red (+), and b* from blue (-) to yellow (+). CIELAB was designed so that the same amount of numerical change in these values corresponds to roughly the same amount of visually perceived change. With respect to a given white point, the CIELAB model is device-independent—it defines colors independently of how they are created or displayed. The CIELAB color space is typically used when graphics for print have to be converted from RGB to CMYK, as the CIELAB gamut includes both the gamuts of the RGB and CMYK color models. Because three parameters are measured, the space itself is a three-dimensional real number space, which allows for infinitely many possible colors. In practice, the space is usually mapped onto a three-dimensional integer space for digital representation, and thus the L*, a*, and b* values are usually absolute, with a pre-defined range. The lightness value, L*, represents the darkest black at L* = 0, and the brightest white at L* = 100. The color channels, a* and b*, represent true neutral gray values at a* = 0 and b* = 0. The a* axis represents the green–red component, with green in the negative direction and red in the positive direction. The b* axis represents the blue–yellow component, with blue in the negative direction and yellow in the positive direction. The scaling and limits of the a* and b* axes will depend on the specific implementation, as described below, but they often run in the range of ±100 or −128 to +127 (signed 8-bit integer). The CIELAB color space was derived from the prior "master" CIE 1931 XYZ color space, which predicts which spectral power distributions will be perceived as the same color (see metamerism), but is not particularly perceptually uniform. Strongly influenced by the Munsell color system, the intention behind CIELAB was to create a space that can be computed via simple formulas from the CIEXYZ space but is more perceptually uniform than CIEXYZ. When storing color values using limited precision, using a perceptually uniform color space can improve the reproduction of tones. CIELAB colors are defined relative to the white point of the CIEXYZ space from which they were converted; thus CIELAB values do not define absolute colors unless the white point is also specified. Often, in practice, the white point is assumed to follow a standard and is not explicitly stated (e.g., for "absolute colorimetric" rendering intent, the International Color Consortium L*a*b* values are relative to CIE standard illuminant D50, while they are relative to the unprinted substrate for other rendering intents).The lightness correlate in CIELAB is calculated using the cube root of the relative luminance. In colorimetry, the CIE 1976 L*, u*, v* color space, commonly known by its abbreviation CIELUV, is a color space adopted by the International Commission on Illumination (CIE) in 1976, as a simple-to-compute transformation of the 1931 CIE XYZ color space, but which attempted perceptual uniformity. It is extensively used for applications such as computer graphics which deal with colored lights. Although additive mixtures of different colored lights will fall on a line in CIELUV's uniform chromaticity diagram (dubbed the CIE 1976 UCS), such additive mixtures will not, contrary to popular belief, fall along a line in the CIELUV color space unless the mixtures are constant in lightness. The photo-receptivity of the "eyes" of other species also varies considerably from that of humans and so results in correspondingly different color perceptions that cannot readily be compared to one another. Honeybees and bumblebees for instance have trichromatic color vision sensitive to ultraviolet but is insensitive to red. Papilio butterflies possess six types of photoreceptors and may have pentachromatic vision. The most complex color vision system in the animal kingdom has been found in stomatopods (such as the mantis shrimp) with up to 12 spectral receptor types thought to work as multiple dichromatic units.The science of color is sometimes called chromatics, colorimetry, or simply color science. It includes the study of the perception of color by the human eye and brain, the origin of color in materials, color theory in art, and the physics of electromagnetic radiation in the visible range (that is, what is commonly referred to simply as light). A color model is an abstract mathematical model describing the way colors can be represented as tuples of numbers, typically as three or four values or color components. When this model is associated with a precise description of how the components are to be interpreted (viewing conditions, etc. ), the resulting set of colors is called "color space." This section describes ways in which human color vision can be modeled. In color reproduction, including computer graphics and photography, the gamut, or color gamut , is a certain complete subset of colors. The most common usage refers to the subset of colors which can be accurately represented in a given circumstance, such as within a given color space or by a certain output device. Another sense, less frequently used but still correct, refers to the complete set of colors found within an image at a given time. In this context, digitizing a photograph, converting a digitized image to a different color space, or outputting it to a given medium using a certain output device generally alters its gamut, in the sense that some of the colors in the original are lost in the process. Huffyuv (or HuffYUV) is a lossless video codec created by Ben Rudiak-Gould which is meant to replace uncompressed YCbCr as a video capture format. The codec can also compress in the RGB color space. "Lossless" means that the output from the decompressor is bit-for-bit identical with the original input to the compressor. Lossless only occurs when the compression color space matches the input and output color space. When the color spaces do not match, a low loss compression is performed. Huffyuv's algorithm is similar to that of lossless JPEG, in that it predicts each sample and then Huffman-encodes the error. This is a list of color spaces and their uses. Quattron is the brand name of an LCD color display technology produced by Sharp Electronics. In addition to the standard RGB (Red, Green, and Blue) color subpixels, the technology utilizes a yellow fourth color subpixel (RGBY) which Sharp claims increases the range of displayable colors, and which may mimic more closely the way the brain processes color information. The screen is a form of multi-primary color display, other forms of which have been developed in parallel to Sharp's version.The technology is used in Sharp's Aquos LCD TV product line, particularly in models with screens 40 inches across and larger. The technology, distinct from the product line, has been advertised featuring George Takei as the spokesperson in the debut commercial, in which he uses his catchphrase "Oh My". Another commercial had Takei advertising the 3-D model with the Minions from the 2010 movie "Despicable Me". RAL is a colour matching system used in Europe that is created and administrated by the German RAL gGmbH (RAL non-profit LLC), which is a subsidiary of the German RAL Institute. In colloquial speech RAL refers to the RAL Classic system, mainly used for varnish and powder coating but nowadays there are reference panels for plastics as well. RYB (an abbreviation of red–yellow–blue) denotes the use of red, yellow, and blue pigments as primary colors in art and design, particularly painting. YPbPr or Y'PbPr, also written as YPBPR, is a color space used in video electronics, in particular in reference to component video cables. YPbPr is the analog version of the YCbCr color space; the two are numerically equivalent but YPbPr is designed for use in analog systems while YCbCr is intended for digital video. YPbPr is commonly referred to as component video by manufacturers; however, there are many types of component video, most of which are some form of RGB. Some video cards come with video-in video-out (VIVO) ports for connecting to component video devices.